Things can get busy and crazy around here. So I have taught my boys how to help out around the house. My boys are learning so much. They already help with the trash, unloading the dishwasher, and folding the clothes. The chore that they are learning right now is how to wash clothes. I am showing them how to properly load the washing machine and how much detergent to use. The most important thing that I am teaching the boys to always use the "color" button on the machine. This button/setting washes the clothes in cold water and is best for the environment. It also saves me money. When I selected my washer and dryer, I made sure they were ENERGY STAR® certified. Why did I select an ENERGY STAR certified washer and dryer? ENERGY STAR certified clothes washers and dryers save energy, which means that I will save on my energy bills. Many are also equipped with advanced features that make cleaning and drying easier and more effective. There are many other features that I like about ENERGY STAR washer and dryers. They are better for the environment which means that I am protecting the climate, leaving it a better place for my kids. ENERGY STAR is also better for my clothes too. The washers are gentler on my clothes and the dryers use less heat and have sensors that reduce wear and tear on my clothes as it prevents over-drying. 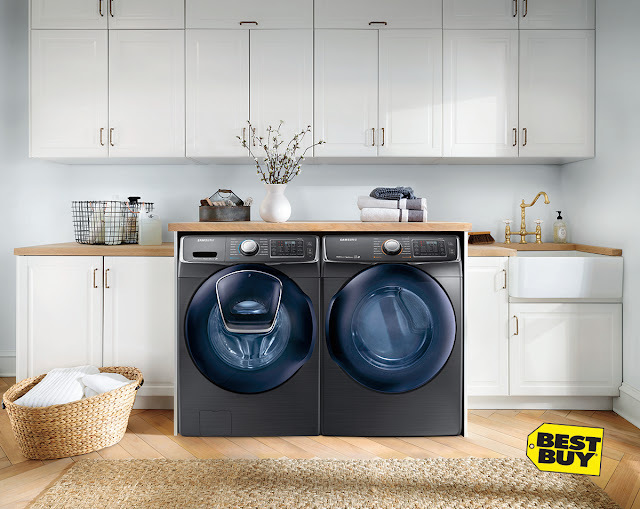 Did you know that you can save $490 over the lifetime of an ENERGY STAR certified clothes washer and even more with an ENERGY STAR washer/dryer pair? I love saving money and love that my ENERGY STAR certified clothes washer and dryer are 25% and 20% more efficient, respectively, than other standard models. My washing machine uses approximately 45% less water than other standard models that I looked at in the store. That can amount to 33,000 gallons of water that I can save during the washers lifetime use! o Long live your clothes– Front-load and advanced top-load clothes washers’ sophisticated wash systems use a variety of methods to lift and tumble your laundry, lengthening the life of often-washed items. Additionally, because they are so gentle, many models can safely clean silk, wool, and other hand-washables. We are looking to replace our washer and dryer in the spring. I will be sure to look for ENERGY STAR certified appliances. These look super nice. I love the look, and can only imagine the functionality. These look awesome! I love all the options they have too! If it saves energy than this is definitely a washer and dryer set worth considering. Good on the pockets that means. I believe all of us need to do our bit for the environment and buying ENERGY STAR certified products is the first step towards it. I love energy star-rated appliances. We make sure that there's always a very high energy star rating for eight Appliance before we purchase it. I love energy star-rated appliances. That washer and dryer looks nice! I like front-load. I used to have a washer with a central agitator and hated it. We had plumbing issues over the weekend, and it was so tough to live regular life. I love the Energy Star appliances and are so thankful for their dependability. Sounds like an amazing washer. Its okay if I do my laundry all day with this machine. Looks cool! Every time I see a post about appliances, I seriously think about how I would love some new ones. These look like they are great! Front load washer are my favorite style for washing machine. It looks like an amazing washer and dryer. We will be redoing our laundry room soon and this is at the top of my list. I definitely could use something that wills ave us money. Energy Star certified washers and dyers are the best way to save money I believe. When I buy appliances I look for the Energy Star stickers because it saves electricity. Thanks for sharing the information.